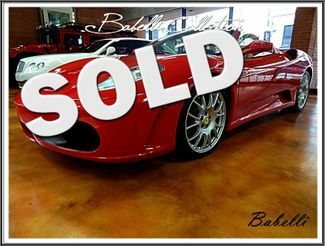 Pristine F430 in Rossa Red!!! Daytona Seats W/ Red Stitching. Leather 4-Way Pwr Adjustable Driver/Passenger Bucket Seats. This Vehicle Is Carfax Certified. Call For Your Free Copy. All vehicles are Subject to Prior Sale. Some vehicle information including mileage, pricing, Features, and Warranty may be unintentionally missing or inaccurate due to involvement of other vendors and human error. Babelli Motor Car Co does not assume responsibility for these errors. Prices and special offers are subject to change.